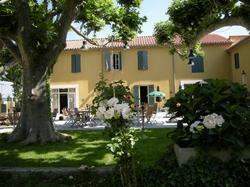 Les Abeilles is located in the historical village of Sablet, in the Côtes du Rhône wine producing region. It offers a gastronomic restaurant and personalised cooking classes using fresh regional products. All rooms have free Wi-Fi access and a flat-screen TV with satellite channels. Each room also has a private bathroom with a shower, a hairdryer and free toiletries. There is also a terrace in the garden and a bar. Breakfast is served daily. Guests can discover the region with the medieval city of Vaison-la-Romaine less than a 15-minute drive away and the Dentelles de Montmirail mountain range just 4 km from Les Abeilles. Free private parking is available on site. This more spacious room has free Wi-Fi access, a flat-screen TV with satellite channels and a private bathroom with a shower, a hairdryer and free toiletries. Each room has free Wi-Fi access, a flat-screen TV with satellite channels and a private bathroom with a shower, a hairdryer and free toiletries. A baby cot cannot be accommodated in this room.